Not all cats enjoy the same canned foods. That’s why we offer a variety of tasty textures and flavours. 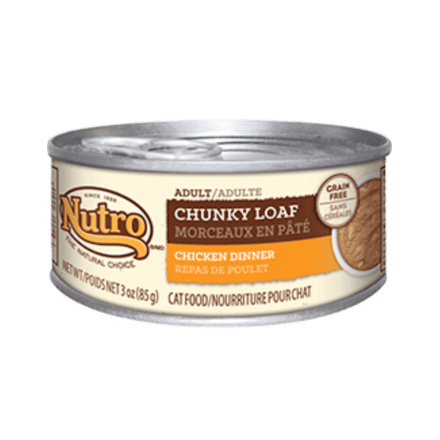 NUTROTM Adult Wet Cat Food Minced Chicken Formula treats your cat to marinated morsels in a rich gravy, providing the right mix of proteins, fats and carbohydrates. Our canned cat food maintains energy, provides for overall good health and is nutritionally complete. Plus, it has a taste your cat will enjoy and the benefits you’ll love. Chicken Broth, Chicken, Chicken Liver, Egg Product, Pork Broth, Natural Flavours, Minerals (Calcium Carbonate, Ferrous Sulfate, Zinc Oxide, Copper Proteinate, Manganese Sulfate, Sodium Selenite, Potassium Iodide), Guar Gum, Tetrapotassium Pyrophosphate, Vitamins (Choline Chloride, Thiamine Mononitrate [Vitamin B1], Vitamin E Supplement, Niacin, d-Calcium Pantothenate, Pyridoxine Hydrochloride [Vitamin B6], Vitamin A Supplement, Vitamin D3 Supplement, Biotin, Vitamin B12 Supplement, Folic Acid), Xanthan Gum, Taurine. To feed alone: Feed an 8 lb. (3.6 kg) adult cat about 3 ¼ cans daily. 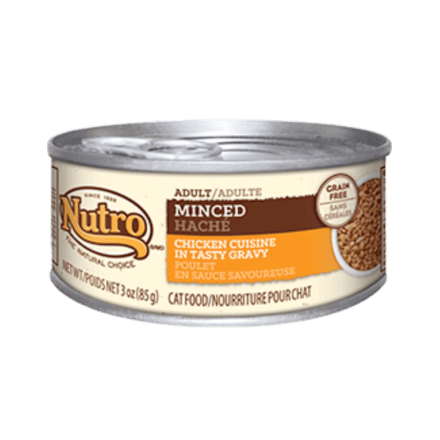 NUTROTM Adult Minced Chicken Cuisine Wet Cat Food is formulated to meet the nutritional levels established by the AAFCO Cat Food Nutrient Profiles for maintenance.